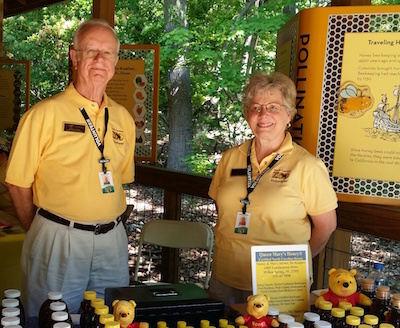 NCSBA members volunteer over 2500 hours annually engaging with the public in the NC Zoo Honey Bee Habitat, and more volunteers are always welcome. Volunteers speak to the public about the pollinator garden, answer questions about the goings on in the observation hive and may even sell their own honey. Volunteer hours may be used as public service credit for the Master Beekeeper Program. Training is provided to all volunteers and has been developed cooperatively by the NC Zoo Volunteer Services Manager and the NCSBA. To learn more about volunteering at the NC Zoo, check out nczoo.org/volunteer. For other details, contact the Zoo Coordinator. Founded in 2009, the NC Zoo Honey Bee Habitat was made possible by a cooperative effort of the North Carolina Zoo, North Carolina State Beekeepers Association, NC Farm Bureau, Syngenta, and NC Zoo Society donors.